Internal sources of recruitment involve motivating the employees of the organization to apply for the openings within the organization. It refers to recruiting employees from within the organization. In deciding the requirement of employees, initial consideration should be given to a company’s current employees, which is concerned with internal recruitment. This is an important source of recruitment as it provides opportunities for better development and utilization of existing human resources in the organization. When the existed employees are given a chance to get the higher positions of the organization than the employee loyalty increases towards the organization. It highly motivates the employees and helps in maximizing job satisfaction. Existed employees of the organization are well known about the organizational culture. 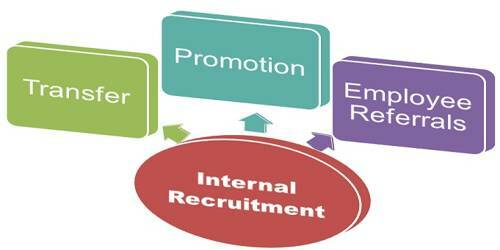 Internal sources of recruitment highly reduce efforts and cost. It helps in reducing employee turnover. It creates a scope to get a competitive advantage by recruiting skilled employees for the higher positions. Transfers from one department to another department helps in eliminating boredom and monotony in employees. It helps in reducing the efforts of induction programs. Internal sources of recruitment reduce the scope of finding skilled and more efficient people. The introduction of new methods and strategies may not always possible with this approach. Losing more efficient persons from the external environment becomes a competitive advantage to the competitors.